Bassick’s Emory Linton goes in for a layup during a game against East Catholic on Friday night at Bassick High School in Bridgeport. East Catholic and Bassick, the second- and third-ranked teams in the GameTimeCT poll, were locked in a low-scoring, close game throughout. Neither team led by more than six and, naturally, it came right down to the end. Four straight 3-pointers by senior guard Joey Reilly gave East Catholic a cushion and Bassick missed a game-tying 3-pointer in the final seconds. East Catholic held on for the 56-53 road win before a sellout crowd. Jaylin Hunter (20 points) made two free throws with 19.8 seconds left to put East Catholic (13-0) up 56-53. Bassick was out of timeouts. Julio De Los Santos ended up taking the final 3-pointer to tie from the corner for Bassick (14-1), but it didn’t go down. This was the 51st consecutive regular-season win for East Catholic. East Hartford was the last team to beat the Eagles during the regular season, 84-73 on Dec. 22, 2016. 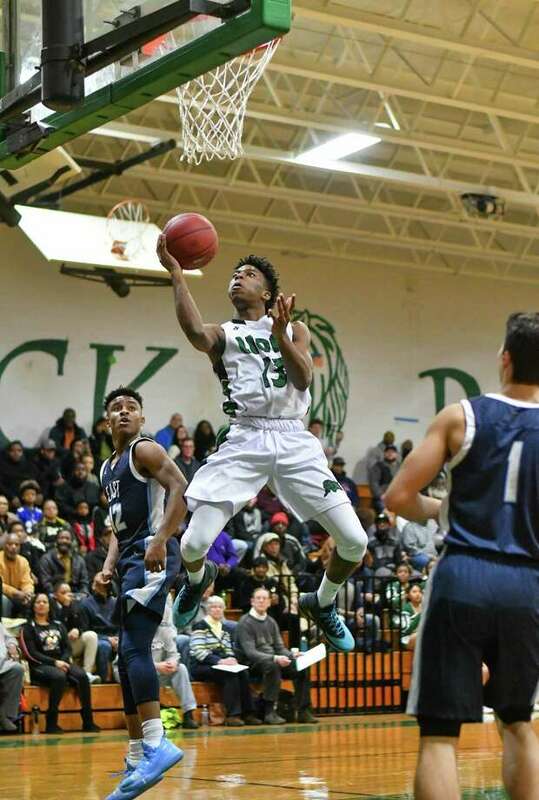 Bassick’s last regular-season loss came at the hands of the Eagles in convincing fashion, 78-42 on Jan. 2, 2018, in Manchester. Bassick scored the first nine points of the fourth quarter, forcing four straight turnovers, to take a 44-38 lead. That happened with both primary ballhandlers, Kevin Crawford and Emery Linton, on the bench in foul trouble. Then Joey Reilly (20 points) went to work. His four straight 3-pointers turned that six-point deficit into a 50-44 lead with 3:18 left. “Every shot I fully believe is going in. I could miss 1,000 shots in a row and I’m still going to have full confidence in myself that the next one is going in,” Reilly said. “I never lose faith in my ability. Bassick players actually had a hand in Reilly’s face on a couple of those 3-pointers. “We couldn’t get off the screens quick enough,” Crawford said. Bassick cut it down to one three different times, but could never draw even. The team shot 6 of 12 from the line in the fourth quarter, 11 of 25 overall. Crawford finished with a game-high 24 points, but shot just 4 of 13 from the line — all in the second half. “This is on us. We’ll get them next time,” Crawford said. Joey Reilly, East Catholic: Made four straight 3-point shots in the fourth quarter to turn a deficit into a lead for good for the Eagles. Joey Reilly 7 2-3 20, Jaylin Hunter 6 4-6 20, Matt Knowling 2 6-6 10, Matt Byam 2 0-0 4, Sam Walsh 1 0-0 2, Chris Jones 0 0-0 0, Brody Limric 0 0-0 0. Totals 19 12-15 56. Kevin Crawford 10 4-13 24, Jermaine Grant 0 1-2 1, DeAndre Morgan 1 0-0 2, Julio DeLos Santos 0 0-0 0, Emery Linton 2 3-4 8, Jordan Gallimore 3 3-6 9, Isaiah Sullivan 3 0-0 7. Totals 20 11-15 53. 3-pointers: EC 8 (Reilly 4, Hunter 4), Bassick 2 (Linton, Sullivan); Records: EC 13-0; B 14-1.